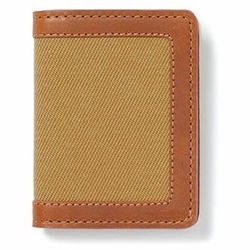 Filson Outfitter Card Wallet. Built for front- or rear-pocket carry, the Outfitter Card Case wallet is made with proprietary Weatherproof Leather and Rugged Twill for years of reliable use. Stitched with heavy-duty bonded-nylon thread.